Need a TAM® Card for the Busy Summer Season? A Rundown on Requirements – TAM Card® Nation in Vegas! As a reminder to anyone selling or serving alcoholic beverages in Southern Nevada, you will need to obtain an alcohol awareness card if you haven’t already. Students often ask for a list of requirements and things to remember prior to taking a TAM® Class with us. Please use the following information as a “cheat sheet” of TAM Card requirements, and pass on to anyone you know who may benefit from this information. 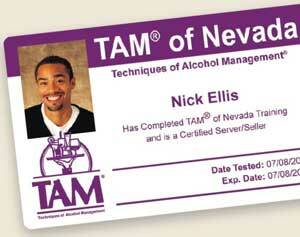 TAM® Cards are required for anyone selling or serving alcoholic beverages in Southern Nevada. This includes servers, bartenders, security professionals at establishments that sell alcoholic beverages, clerks at grocery and convenience stores who sell alcoholic beverage products, and more (Nevada Revised Statutes). Additionally, TAM Cards ARE required for anyone selling or serving alcoholic beverages for any length of time, including special one-time events. We often receive calls asking if TAM® Cards are needed for individuals who will be working to sell or serve alcoholic beverages for festivals, special weekend events, and similar situations. Even if you will only be working in this type of position for a short period of time, a TAM® Card is still mandatory. You must be 16 years of age or older to obtain a TAM Card. Read more about age requirements in our blog post, “TAM Cards for Teens.” Remember, you must be 21 years of age or older to serve or sell open alcoholic beverages, but teenagers and young adults who work as cashiers or clerks at grocery or convenience stores that sell sealed alcoholic beverages may need to obtain alcohol awareness training. You must present valid picture ID when attending a TAM® Class or sitting for a proctored exam. When you come to the TAM® Training Center for your TAM® Class, or to complete your exam if you took the online course, remember to bring a valid form of identification. Examples of valid ID include a driver license, passport, or state identification card. Please check the TAM® of Nevada website for a complete list of accepted forms of ID. Classroom training is NOT required; you can take your alcohol awareness course online. TAM® of Nevada offers classes both online or onsite. The choice is yours on which option fits best with your lifestyle and schedule. You’ll receive the same great training and a valid TAM® Card with either option. Online or in the classroom, plan on dedicating about 3 hours to your alcohol awareness training. State law requires that each student receives robust training following specific topics and curriculum, so plan to spend about three hours in your online or on-site training program followed by a short exam. Contrary to popular belief, there is no such thing as a “shorter” class for students who need to renew their alcohol education cards. State law mandates that students must complete the entire program every four years to remain in compliance. Hopefully this clears up any questions about TAM Card requirements. Sign up for one of our classes at TAM of Nevada’s website. We look forward to seeing you soon! Pingback: Alcoholic Beverage Service at Special Events – Are You Following the Law? | TAM® Nation in Vegas!